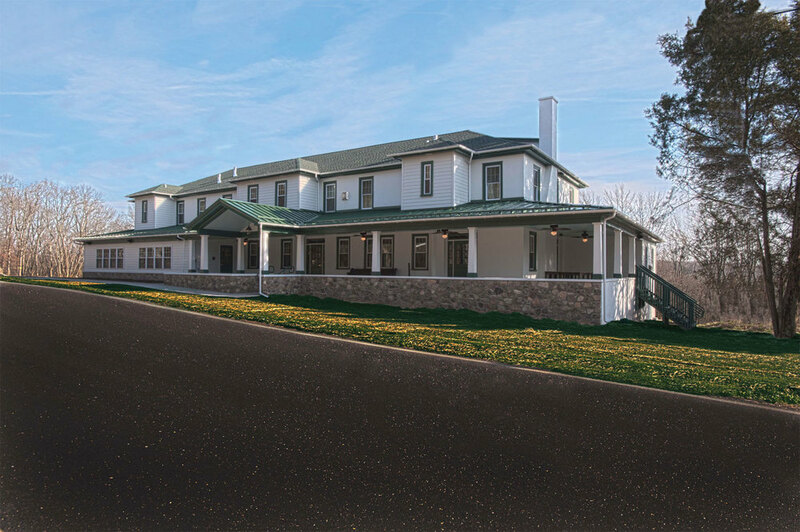 The Woodside Lodge, formerly known as Woodside Manor was built by Morris Carl in 1925 on the south side of Spring Mountain. It was operated for many years as a homey countryside resort hotel. In the 1970's the property was turned int a nursing home and later became a restaurant called the Woodside Inn. As early as 1830 , plans had been discussed for a railroad that would run parallel to the Perkiomen, connecting the Philadelphia and Norristown roads with the Lehigh area. Operations finally began in 1868 at Perkiomen junction in Chester County. The road traveled into the into the valley through Collegeville, Rahns and Graterford, ending at Skippack Station one-half mile below town. A year or so later, it was continued to Schwenksville. The first locomotive to arrive in Schwenksville on the newly laid track was appropriately named "The Perkiomen". Morris Carl was the station agent in 1903. Passenger service was good and well patronized, especially during the Summer months when extra cars were added to accomodate the people who vacationed in this area. Woodside Manor, Perkiomen Inn, Spring Mountain House, The Cedars, and the Weldon House were among the establishments catering to "die Summer frischlers" (a Pennsylvania Dutch expression meaning "those Summer people who came to refresh themselves"), as well as nearby boarding houses. The high spot of the day for the local residents was to meet the trains that carried all of the vacationers. 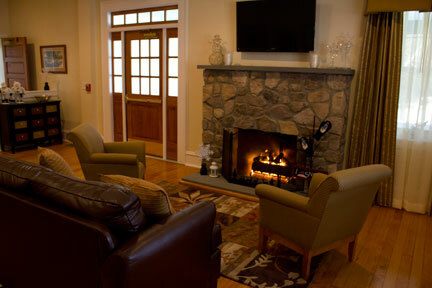 The Woodside Lodge is located on the back side of Spring Mountain. 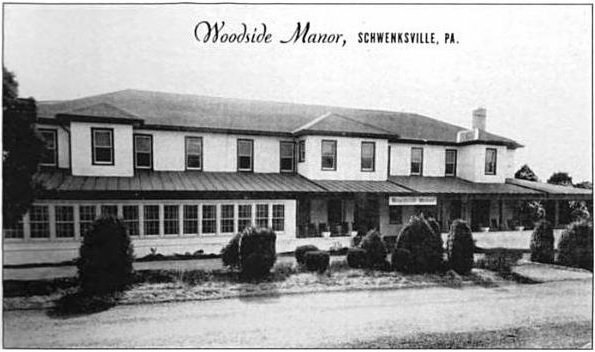 It was built in the early 1920's and is the last standing Inn among several that catered to that periods travelers who came by train to Schwenksville to escape Philadelphia 's summer heat. The cool winds and the beaches then located along the Perkiomen Creek made Spring Mountain the place to be for the first half of the twentieth century. In fact, Rick's father worked as a bus-boy during his teenage years at the Woodside and his Aunt had her wedding reception there! In poor condition, the vision was to restore the Woodside Lodge to the wonderful meeting place that so many travelers and locals remember and to compliment our existing businesses by providing overnight lodging and breakfast for our guests. A full bar, Buckman Tavern, and Restaurant are open to the public and a Banquet Room that holds up to 100 people is available for meetings and special events. There are 8 two-room suites and a future bunk room each with their own fireplace for a restful nights sleep before or after your special event or activity.